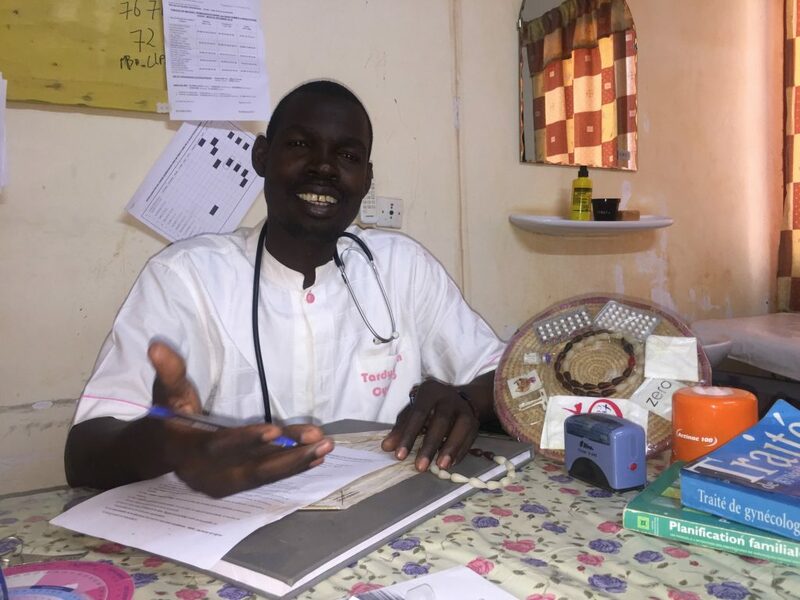 Burkinabe Midwife Moussa Gansonre counsels women on the health benefits of family planning for moms and babies, recognizing the needs of women and the importance of healthy families to his country. Photo by Charles Wanga. Today is a day that would change Alizata Ouedraogo’s life. Just a few hours earlier, the 33-year-old mother received a postpartum intrauterine device (PPIUD) during a visit to her local health provider. “I’m tired. Four children, that’s enough,” said Ouedraogo, when asked why she and her husband had chosen this long-acting, reversible family planning method. Now, she won’t have to worry about an unintended pregnancy. On this November day, Gansonre greeted his client Ouedraogo, who had swaddled her 40-day-old son on her back with hand-embroidered shawls that she also sells. Although the midwife towers over his petite client, his gentle demeanor and easy laugh shine through as they talk. Ouedraogo then sits and holds the baby against her chest. When he starts to fuss, she bounces him on her lap. The 40-year-old father of three breaks into a big smile as he proudly explained that he’s a “sage-homme,” or male midwife. Gansonre, a trained nurse, had not considered the profession of midwifery to be a man’s place. That all changed in 2001 when a male midwife provided critical care to Gansonre’s wife Mariam during the very difficult delivery of their firstborn. “It was by chance that the midwife was passing through the health facility that day,” Gansonre said. “If he hadn’t delivered the baby, things would have gone bad.” This chance encounter had inspired Gansonre to return to school to become a midwife himself. 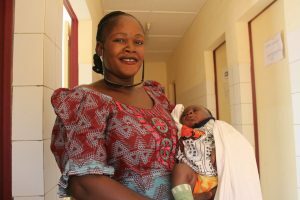 After graduating from Burkina Faso’s National Public Health School in 2009, Gansonre began his new career at the district hospital that today boasts about 400 deliveries a month. Health care providers at the hospital have ample opportunity to discuss possible postpartum family planning (PPFP) methods with their clients before childbirth, during antenatal care visits, and after delivery during postnatal care visits. After this counseling, clients then can select the contraceptive method that best suits their families’ needs. The country has great potential for using PPFP methods, with an overall fertility rate of 6 children per woman and 6.7 children per woman in rural areas—where three-quarters of the population lives—and an unmet need for family planning of 24 percent. In addition, 81 percent of Burkinabe women in the postpartum period have a need for family planning because they do not want another pregnancy in the two years after a birth. “Mothers understand that it’s necessary to space their births. It allows them to continue working,” Gansonre said. Recognizing women’s unmet need for family planning, the government of Burkina Faso, with support from Jhpiego, launched an ambitious initiative to ensure that health care providers have the skills to provide quality PPFP services to couples who want to plan for the size of their families in a safe and healthy manner. After the London Family Planning Summit in 2012, Jhpiego committed $200,000 to support PPFP methods, particularly long-acting ones like the PPIUD Ouedraogo received. Between 2013 and 2015, in collaboration with the Ministry of Health, Jhpiego implemented a pilot project at five health care facilities and then extended it to 21 additional sites with funding from the United Nations Population Fund. As a result of this effort, 11,333 women benefited from PPFP counseling. Of these women, 1,629 (14.4 percent) chose and received PPIUDs; data on other contraceptive methods chosen were not readily available. This success then helped garner funding from an anonymous donor to further improve access to PPFP. With this additional funding, Jhpiego, again in collaboration with the health ministry, has worked to enhance the project, which will run through March 2018. Together, they sought to integrate PPFP into the existing maternal and newborn services by strengthening educational institutions’ capacity to teach this essential component of reproductive, maternal and newborn health. Burkina Faso was among 16 countries to send a delegation to the June 2015 PPFP Global Meeting in Chiang Mai, Thailand, and the country has emerged as having one of Jhpiego’s most innovative PPFP programs in West Africa. Ouedraogo then easily balances her baby on her back as he stares wide-eyed and grinning. She ties him securely to her, covering him well. She says goodbye to Gansonre as she gets on her motorbike. The baby softly cries as the motorbike kicks up dust and his mother rides off. Gansonre then turns to greet a young woman, his next client, with a smile. Yacouba Ouedraogo, Monitoring and Evaluation Officer, and Dr. Cheick Ouedraogo, Director of the PPFP Project, of the Burkina office, contributed to this story. Photos taken by Charles Wanga, Africa Regional Communications Specialist.